Digital Oscilloscope, 2 Channels, 30 MHz, 250 MS/s total Digital storage oscilloscope of the latest generation with high-resolution color display, backlight, high bandwith and high sampling rate, VGA-output, large internal memory, USB port and LAN connection for integration into networks. The amazing value for money and modern technology allow a wide range of applications in education, service and quality assurance area. 60 MHz/2 CH, 250 MSa/s, Digital Storage Oscilloscope Digital storage oscilloscope of the latest generation with high-resolution color display, backlight, high bandwith and high sampling rate, VGA-output, large internal memory, USB port and LAN connection for integration into networks. The amazing value for money and modern technology allow a wide range of applications in education, service and quality assurance area. Digital Oscilloscope, 2 Channels, 70 MHz, 1 GS/s total Digital storage oscilloscope of the latest generation with high-resolution color display, backlight, high bandwith and high sampling rate, VGA-output, large internal memory, USB port and LAN connection for integration into networks. The amazing value for money and modern technology allow a wide range of applications in education, service and quality assurance area. Digital Oscilloscope, 2 Channels, 100 MHz, 1 GS/s total Digital storage oscilloscope of the latest generation with high-resolution color display, backlight, high bandwith and high sampling rate, VGA-output, large internal memory, USB port and LAN connection for integration into networks. The amazing value for money and modern technology allow a wide range of applications in education, service and quality assurance area. Digital Oscilloscope, 2 Channels, 125 MHz, 1 GS/s total Digital storage oscilloscope of the latest generation with high-resolution color display, backlight, high bandwith and high sampling rate, VGA-output, large internal memory, USB port and LAN connection for integration into networks. The amazing value for money and modern technology allow a wide range of applications in education, service and quality assurance area. Digital Oscilloscope, 2 Channels, 100 MHz, 2 GS/s total Digital storage oscilloscope of the latest generation with high-resolution color display, backlight, high bandwith and high sampling rate, VGA-output, large internal memory, USB port and LAN connection for integration into networks. The amazing value for money and modern technology allow a wide range of applications in education, service and quality assurance area. Digital Oscilloscope, 2 Channels, 200 MHz, 2 GS/s total Digital storage oscilloscope of the latest generation with high-resolution color display, backlight, high bandwith and high sampling rate, VGA-output, large internal memory, USB port and LAN connection for integration into networks. The amazing value for money and modern technology allow a wide range of applications in education, service and quality assurance area. 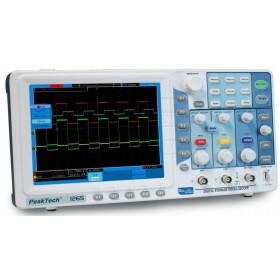 Digital Oscilloscope 12 bits 2 Channels 100MHz 1GS/s total, 25MHz Generator, 200MHz Frequency Counter, Digital Multimeter This newly developed and innovative digital storage oscilloscope offers cutting-edge technology and performance, and multi-functionality for different user groups from the electronics-service, development or industrial sector. The unit benefits from a clean and fast waveform display thanks to its used 12-bit technology which can be represented by its fast waveform update rate and accurate detection of even the smallest error and variations in waveform display. Also the slim case design at only 9 cm overall depth of the device and the intuitive operability while delivering excellent image display on the highresolution Touchscreen TFT-display should be highlighted. 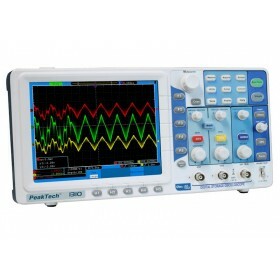 Digital Oscilloscope, 2 Channels, 300 MHz, 2.5 GS/s total Digital storage oscilloscope of the latest generation with high-resolution color display, backlight, high bandwith and high sampling rate, VGA-output, large internal memory, USB port and LAN connection for integration into networks. The amazing value for money and modern technology allow a wide range of applications in education, service and quality assurance area. 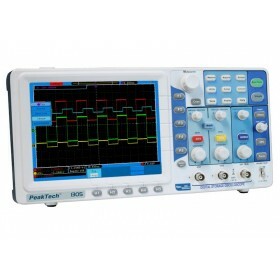 Digital Oscilloscope, 2 Channels, 300 MHz, 3.2 GS/s total Digital storage oscilloscope of the latest generation with high-resolution color display, backlight, high bandwith and high sampling rate, VGA-output, large internal memory, USB port and LAN connection for integration into networks. The amazing value for money and modern technology allow a wide range of applications in education, service and quality assurance area.